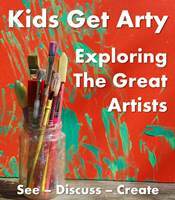 It's time for Kids Get Arty! 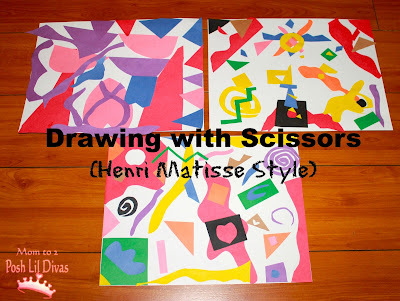 This month I introduced the girls to Henry Matisse. While perusing some of his works online the girls were drawn to his paper cut out art and I knew we had found our inspiration. We focused on working with paper cut outs in various colors and shapes and using them to make a collage in the style of Matisse. It was so much fun even I joined in and created a collage. Can you tell which is mine in the above photo? 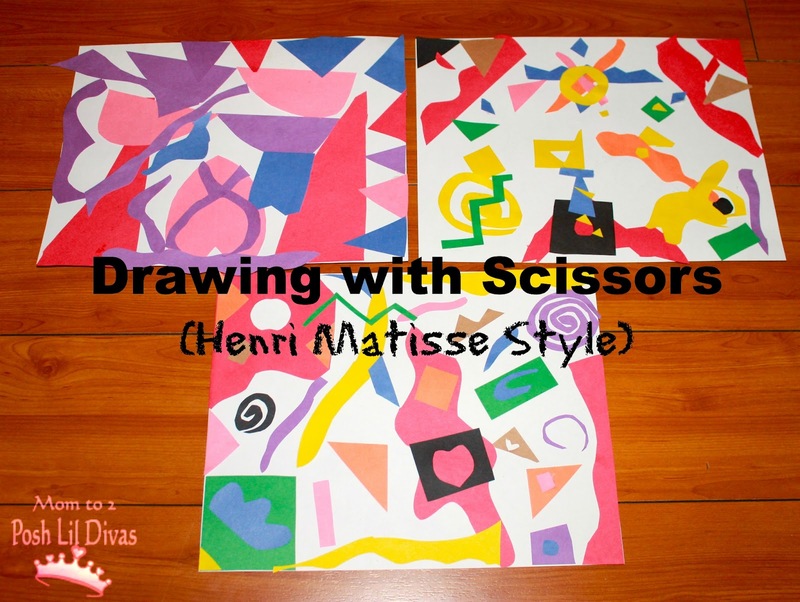 We read the book Henri Matisse: Drawing with Scissors by Jane O'Connor. 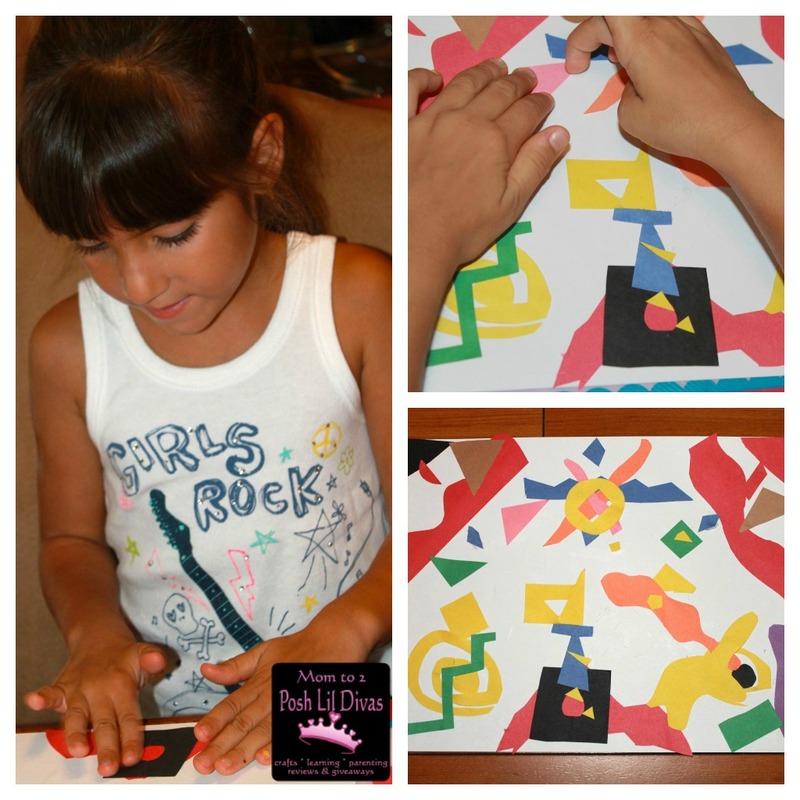 I gave the Lil Divas free reign and it was wonderful to see how they both approached their art so differently. The Oldest Diva used large pieces (mostly triangles and hearts) in red, pink, purple and blue. She was very deliberate and I noticed she had trouble just letting go and cutting. When I encouraged her to just cut without a particular shape in mind, she told me she couldn't. She was done very quickly and it surprised me that she found this activity difficult. She loves art and is always drawing. Thinking about it, she always has an end goal in mind though. She isn't very abstract or about the process. This is something I plan to explore with her a bit more, to see if she can shift out of her comfort zone and let lose. Any suggestions on which artist we can explore next that will help us do that? The Littlest Diva used lots of color, worked hard at making all kinds of shapes and using them to create pictures in her art. Her art told a story - there is a castle, the sun, clouds, birds, butterflies, a snake and more. As she freely cut and pasted her story unfolded and came to life in her imagination. It was magical. Her imagination never ceases to amaze me. The art work turned out great and I enjoyed watching the Lil Divas at work and seeing their masterpieces unfold. Now it's your turn! 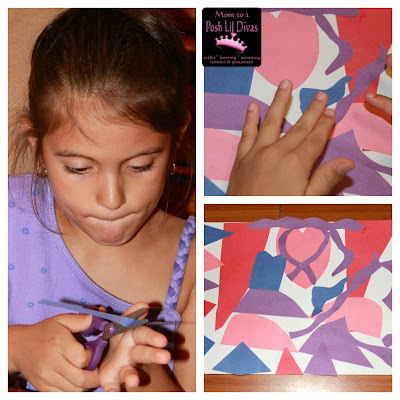 Join Red Ted Art, The Imagination Tree, Imagination Soup, Tinkerlab, Creative with Kids and me for Kids Get Arty by linking up below. I can't wait to see what artists you have all explored with your kids. The next Kids Get Arty will be on November 14, 2012! Find a new artist to explore & get arty! so happy you found us Rachel and how wonderful Amanda is for sharing us with you. Did you see our Virtual Book Club? I hope you can join in - sounds like something you would enjoy. wow! That is very creative! Thank you Roshni, my girls enjoy snipping away with scissors so I knew they would enjoy this. Wonderful! I do love how they had different approaches and yet were inspired by the same artist. Great artwork. Wonderful inspiration. So pleased to have you as such a fab co host to Kids Get Arty! Thank you Maggy. I LOVE being part of this with you - it has been so wonderful for us. Lovin' this and look forward to doing something with my Little Mister for the next one in Nov! I absolutely love this kind of thing! It makes me want to go back into teaching - but just art, nothing else!! This is wonderful! Such vibrant colours and shapes. I was wondered to see such a creativity by little girl. She is looking professional in her field having a lot of artistic skills.